When ATRP was initially developed,(17,18) the concentration of catalyst complex used in a typical polymerization was equivalent to the moles of initiator employed for the reaction; i.e. with bpy as ligand the mole ratio of reagents was [I]:[Cu]:[L] = 1:1:3, in order to achieve sustainable reaction rates. Therefore, catalyst removal or catalyst reduction was, and remains a critical step in the preparation of pure copolymers, particularly since catalyst removal and recycle may cause environmental problems and imparts economic costs that commercial manufacturers would have to address. In the laboratory, the transition metal compounds were initially removed from the reaction medium by passing a solution containing the product and oxidized catalyst through a column or pad of acidic or neutral alumina, silica and/or clay. (19) If one is concerned about chain end functionality neutral alumina should be used. The range of media that could be used in this catalyst removal step was later expanded to include ion exchange resins with acidic groups which would allow recovery and recycle of the transition metal. (20,21) The rate of catalyst removal was found to be dependent on the polarity of the solvent and generally increased as the solvent polarity and/or temperature increased. The rate of catalyst removal was also dependent upon the size of the copper complex and the type of ion exchange resin. Dowex MCS-1 macroporous 20-50 mesh resin was the most efficient resin examined, with Cu/PMDETA and Cu/Me6TREN the fastest complexes to be adsorbed. Other agents that have been reported to be successful at removing copper catalyst complexes include carbon black, carbon filters, kaolin, hydrotalcite, acidic clays, and Mg silicate. Nevertheless, it remains a desirable objective to identify additional methods to reduce the amount of transition metal used in the process and develop procedures to remove and potentially recycle the metal complex after the polymerization is complete to provide options for corporations who wish to consider ATRP as a method for preparation of designed materials for a particular application. In aqueous biphasic systems when copper based ATRP catalysts are exposed to air they are oxidized to CuII and in the presence of an appropriate ligand migrate to the aqueous phase of an emulsion or miniemulsion system. The catalyst complex can be adsorbed onto an ion exchange resin, or given time, they precipitate out as a solid, unpublished observation. The catalyst can readily be recycled using AGET or ARGET ATRP initiation procedures. The following table and images summarize the results of some of the purification procedures used to remove copper from an ATRP reaction. Table 1. Copper concentration (in ppm by mass) remaining after purification of polystyrene prepared by Normal, ARGET, and ICAR ATRP. a Where NR = no removal of copper directly from the polymerization solution, NP = no precipitation, HP = precipitation into hexanes, MP = precipitation in methanol, AC = passing of polymer solution through alumina column, 10R = stirring polymer solution with 10 wt.-% ATRP Pure® resin, and 2HP = 2 precipitations into hexanes. Figure 1. 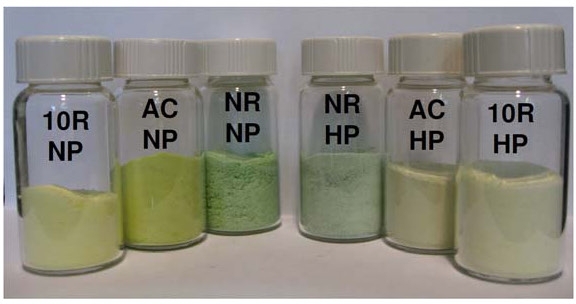 Image of polystyrene samples prepared using normal ATRP after various purification techniques, where NR = no removal of copper directly from the polymerization solution, NP = no precipitation, HP = precipitation into hexanes, MP = precipitation in methanol, AC = passing of polymer solution through alumina column, and 10R = stirring polymer solution with 10 wt.-% ATRP Pure resin. Figure 2. Image of polystyrene samples prepared using ARGET ATRP after various purification techniques, where NR = no removal of copper directly from the polymerization solution, NP = no precipitation, HP = precipitation into hexanes, MP = precipitation in methanol, AC = passing of polymer solution through alumina column, and 10R = stirring polymer solution with 10 wt.-% ATRP Pure resin. Figure 3. Image of polystyrene samples prepared using ICAR ATRP after various purification techniques, where NR = no removal of copper directly from the polymerization solution, NP = no precipitation, HP = precipitation into hexanes, MP = precipitation in methanol, AC = passing of polymer solution through alumina column, 10R = stirring polymer solution with 10 wt.-% ATRP Pure® resin, and 2HP = 2 precipitations into hexanes. (1) Matyjaszewski, K.; Wei, M.; Xia, J.; McDermott, N. E. Macromolecules 1997, 30, 8161-8164. (2) Ando, T.; Kamigaito, M.; Sawamoto, M. Macromolecules 1997, 30, 4507-4510. (3) O'Reilly, R. K.; Gibson, V. C.; White, A. J. P.; Williams, D. J. Journal of the American Chemical Society 2003, 125, 8450-8451. (5) Uegaki, H.; Kotani, Y.; Kamigaito, M.; Sawamoto, M. Macromolecules 1997, 30, 2249-2253. (6) Braunecker, W. A.; Itami, Y.; Matyjaszewski, K. Macromolecules 2005, 38, 9402-9404. (7) Patten, T. E.; Xia, J.; Abernathy, T.; Matyjaszewski, K. Science (Washington, D. C.) 1996, 272, 866-868. (8) Matyjaszewski, K.; Patten, T. E.; Xia, J. J. Am. Chem. Soc. 1997, 119, 674-680. (9) Xia, J.; Matyjaszewski, K. Macromolecules 1997, 30, 7697-7700. (10) Xia, J.; Gaynor, S. G.; Matyjaszewski, K. Macromolecules 1998, 31, 5958-5959. (11) Kickelbick, G.; Matyjaszewski, K. Macromol. Rapid Commun. 1999, 20, 341-346. (12) Xia, J.; Zhang, X.; Matyjaszewski, K. ACS Symp. Ser. 2000, 760, 207-223. (13) Matyjaszewski, K.; Goebelt, B.; Paik, H.-j. ; Horwitz, C. P. Macromolecules 2001, 34, 430-440. (14) Gromada, J.; Matyjaszewski, K. Macromolecules 2001, 34, 7664-7671. (15) Tang, H.; Arulsamy, N.; Radosz, M.; Shen, Y.; Tsarevsky, N. V.; Braunecker, W. A.; Tang, W.; Matyjaszewski, K. Journal of the American Chemical Society 2006, 128, 16277-16285. (16) Tsarevsky, N. V.; Braunecker, W. A.; Tang, W.; Brooks, S. J.; Matyjaszewski, K.; Weisman, G. R.; Wong, E. H. Journal of Molecular Catalysis A: Chemical 2006, 257, 132-140. (17) Wang, J.-S.; Matyjaszewski, K. J. Am. Chem. Soc. 1995, 117, 5614-5615. (18) Matyjaszewski, K.; Wang, J.-S. In PCT Int. Appl. ; (Carnegie Mellon University, USA). WO 9630421, 1996; p 129 pp. (19) Matyjaszewski, K.; Coca, S.; Gaynor, S. G.; Greszta, D.; Patten, T. E.; Wang, J.-s.; Xia, J. In PCT Int. Appl. ; (Carnegie Mellon University, USA). WO 9718247, 1997; p 182 pp. (20) Matyjaszewski, K.; Pintauer, T.; Gaynor, S. Macromolecules 2000, 33, 1476-1478. (21) Matyjaszewski, K.; Gaynor, S. G.; Paik, H.-j. ; Pintauer, T.; Pyun, J.; Qiu, J.; Teodorescu, M.; Xia, J.; Zhang, X. In PCT Int. Appl. ; (Carnegie Mellon University, USA). WO 0056795, 2000; p 200 pp. (22) Ydens, I.; Moins, S.; Botteman, F.; Degee, P.; Dubois, P. e-Polymers 2004, No pp. given. (23) Zhang, H.; Abeln, C. H.; Fijten, M. W. M.; Schubert, U. S. e-Polymers 2006, No pp. given. (25) Faucher, S.; Okrutny, P.; Zhu, S. Macromolecules 2006, 39, 3-5. (26) Niibayashi, S.; Hayakawa, H.; Jin, R.-H.; Nagashima, H. Chemical Communications 2007, 1855-1857.